Hand therapy, a specialty practice area of occupational therapy, is typically concerned with treating orthopedic-based upper-extremity conditions to optimize the functional use of the hand and arm. Conditions seen by the occupational therapy practitioner specializing in this area include fractures of the hand or arm, lacerations and amputations, burns, and surgical repairs of tendons and nerves. Acquired conditions such as tendonitis, rheumatoid arthritis and osteoarthritis, and carpal tunnel syndrome also are treated by occupational therapy practitioners specializing in hand rehabilitation. Occupational therapy is the healthcare profession that aims to restore a patient’s functional capacity. Using specific assessment and treatments skills, occupational therapists specializing in hand therapy offer therapeutic approaches to restore function, limit the progression of a pathology or prevent upper limb dysfunction in order to help patients resume their everyday tasks at home and at work, and their recreational activities. An occupational therapist generally does this by using splints. A splint is used to support, immobilize, or protect the arm or hand. Splints can also be used to support function, assist and/or increase range of motion. Occupational therapists (OTs) can make custom splints for the specific needs of each person or may use pre-fabricated splints. Splints can be static, dynamic or static progressive. Static splints are often used to put part or all of the elbow, wrist & hand at rest so that diseased or injured tissue can be supported and undergo uninterrupted healing. Dynamic or static progressive splints are used to add mobilizing tension to influence tissue healing and scar maturation, minimizing the development of restrictive scar tissue that is so detrimental to tendon excursion and normal joint motion. Static splints are generally made to protect healing structures such as a fracture, a collateral ligament strain or repair, but are also used effectively to decrease pain during functional activity with a diagnosis such as CMC arthritis or tendonitis. Who can benefit from splint usage? The use of splints can come from many different conditions, but there are generally four purposes outlined for the client need of splinting viz. immobilization – stop movement, mobilization – gain movement, restriction – restrict the movement for an area and torque transmission – alter the force felt from an area. Let’s explore some of the splints used to help with medical conditions. After a stroke, patients may experience an unusual tightening of the muscles in and around the hand, usually on the weaker side of the body. This is called spasticity. Medical studies highlight 20 to 30% of stroke survivors experience this condition. Left untreated, spasticity can cause a patient’s joints and muscles to become so tight that it is impossible to move them, which leads to contracture. But by employing correct medical treatment, occupational therapists can prevent contracture in these patients. Primary treatment in occupational therapy is key in helping patients understand the challenges and correct treatment of stroke during recovery. In the past and even today, therapists have treated contractures using static hand splints. It is believed these splints help provide sufficient stretch to the affected soft tissue. But today dynamic splints are increasingly used as they are very effective and can even help reduce side effects caused by static splints, such as joint damage and hypermobility. Dynamic hand splints improve range of motion and prevent pain resulting from contracture. They allow for more mobility throughout recovery while providing support and stability for the contracture area. 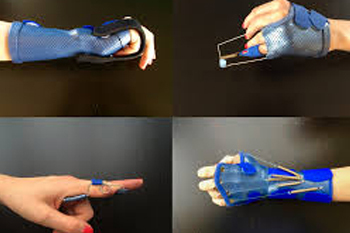 Dynamic splints use a technology that allows the fingers and joints to move through flexion. This helps the fingers relax, which in turn gradually returns the fingers to their natural position. Dynamic splints in particular are highly beneficial for neurologically impaired clients, especially with improving mobility and minimizing joint pain and damage. It is made with energy-storing technology, which allows patients suffering from spasticity and contracture to safely stretch their tight muscles and joints. This results in a greater range of motion and compliance in the affected areas. Another major medical area where splints are necessary is burns. Dynamic and static splints are highly used post surgery for a number of reasons or causes. The buddy strap is most commonly used after a sports injury, or fracture of a finger. • Removable for wound care, bathing, or gentle exercise if appropriate.